Do you have any advice, based on your experience, that would help me to manage more stormy conditions you have in the open ocean? 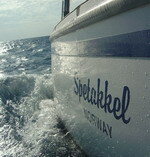 Thanks for your answer about the Ericson boat, and some changes you would make on your boat. I have talked with many people and read a lot about boats, and am pleased to have bought my 1984 Ericson 30+. I think the quality has remained good through the 1980s--they added a Triaxial Grid (reinforced stringers under the cabin sole to reinforce the hull more) and changed the keel shape to what they call a triangular Delta fin keel. I have had the boat since spring, 2006, so am still learning about it, but so far I am very pleased with how it sails. I have been sailing for about 15 years, and have owned two boats before this one. But all of my sailing has been on lakes or coastal waters, so I have no experience in very heavy weather--winds above 30 knots and waves more than about 5 feet. Do you have any advice, based on your experience, that would help me to manage more stormy conditions you have in the open ocean? Although it was intense this picture is taken in a squall not a 40+ knot storm. You probably have more experience than me. I started with 14 hours in a 24 footer then went to Trinidad and bought this boat. I have only had two or three bad storms but it is never pleasant. I agree with books and people saying that hive to on a slick with a parachute to the side of the boat is probably the best survival technique in a hurricane or extremely foul weather but this techniques is to advanced for me and I would probably mess it up and capsize in the attempt. Have a good 3'rd reef. With a 3'rd reef in the main you can sail almost in anything. Practice reefing and doing a good and safe job reefing. Make the sail straight and tight. If it is not tight and straight the sail could be 'blown out' (like mine) or you need to adjust somthing. 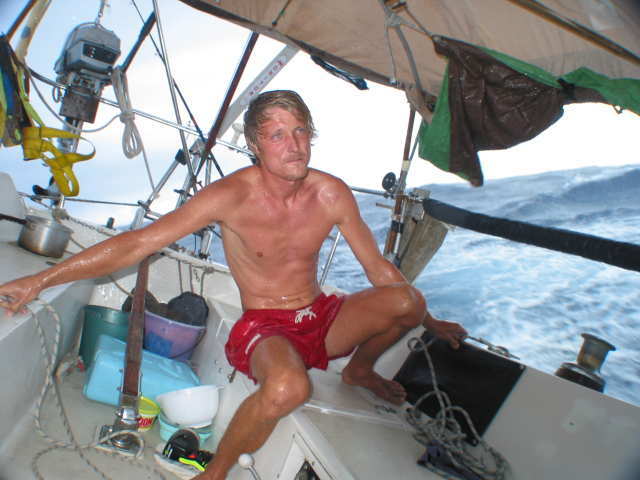 On my worst storm I sailed with bare poles and made 6+ knots. (letter nb. 16) In the end i took the sail down and went downstairs to be in a washing machine for 30 hours. It was safe because there were no braking waves (even though they were big) but very uncomfortable. The whole thing was my own fault because I did not listen to the weather well enough and allowed myself to be rushed, a big mistake I will not do again. Listen to the weather and if you don't have time to stay in that port for some reason, stay anyway. Do not risk your own and/or other peoples lives because of a job waiting or people expecting you for something. Buy the book, Storm Tactics Handbook by Lin and Larry Paraday. Many people will tell you many things, my final advice, make up your own mind and always ask the person telling you what to do if he has cruised himself for more than a week or two. Always, Always put safety first.